Healthy kids. Healthy families. Healthy communities. It’s been proven that increasing physical activity decreases chronic illness over a lifetime, and medical research indicates that goal setting and attainment enhance well-being. Further, a wide range of research has linked generosity to better health. These three things – activity, empowerment, benevolence – define us at TCW™. They are the trifecta that everyone in the community can bet on and win: more movement, more empowerment, more giving. TCW™ works for people in need across the US to empower both the young and old to transform their own lives, their children’s futures, and their local communities. Our process of engaging youth in “the Trifecta” fosters intentional participation in the attainment of health goals and the promotion of individual well-being. We multiply our outreach by partnering with like-minded non-profit organizations such as the Presbyterian Church of Hudson, the YMCA Swin Academy, and Free Bikes for Kidz. And we partner with you. Small donations or large, we synergize them, and we give them back for the betterment of all. Join us at TCW™. Be moved. Be empowered. Give, and be well. 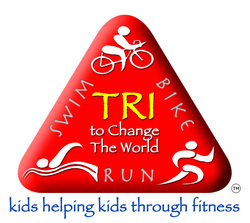 Swim, bike, run, and have fun! Tri to Change the World, Inc. (TCW)™ was founded by the sister-brother team of Emma and Rob Moody when they were 10 and 8 years old. Our mission is to empower children to live healthier lives by encouraging activities that stress the importance of exercise. We remove barriers to physical fitness by raising money to provide bikes and swim lessons to children who cannot afford them. Also each year TCW™ chooses a different organization to raise money for -- one that advocates specifically for youth in need. TCW™ is a 501(c)3 non-profit corporation founded in the state of Wisconsin, operating as a charitable organization. The organization is administered by a board of volunteer directors who are committed to seeing Emma and Rob's dream of helping others become a reality.